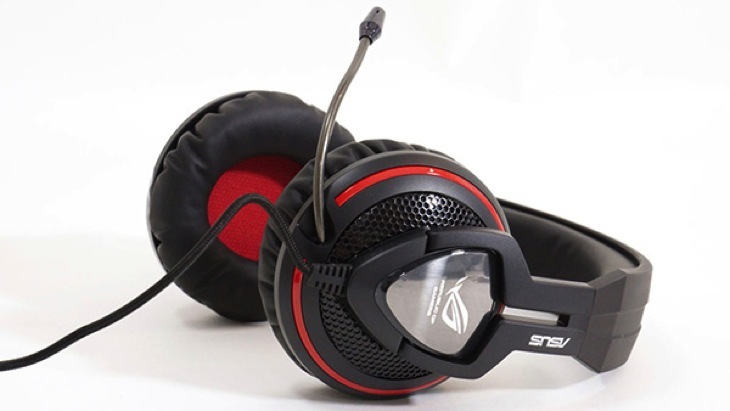 In our second ASUS gaming headset review, we’re looking at the middle of the range, the Orion. Will it suffer from middle sibling syndrome? Don’t just wave this one off as the second movie in a trilogy – the Orion stands its ground with the other ASUS headsets. Considering the length of time we tend to wear headsets, it’s important that they are as comfortable as possible. The Orion certainly meets those demands. 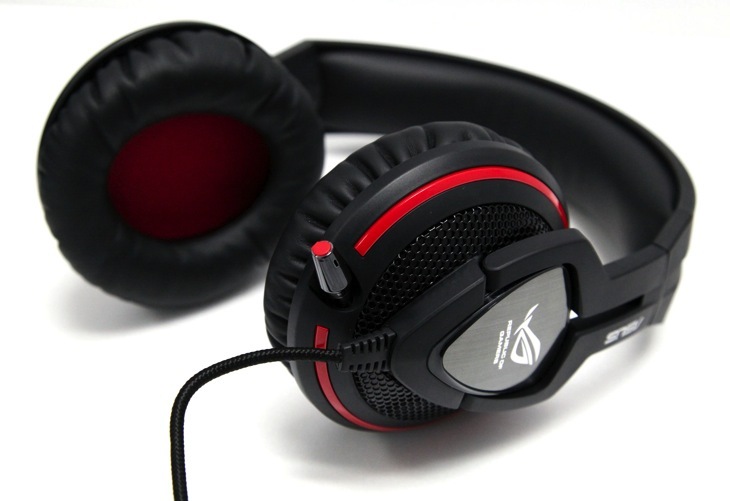 Similar to the Cerberus, it features 100mm ear cups cushioned with a soft-leather-feel substance. It fits over the ears with a snug fit to help with noise isolation. The cushioned headband ensures that the 268 grams of headset don’t dig into the skull; the headband doesn’t self adjust, but it is easy to create a range of sizes on the fly, making it adaptable to those who sport large or small crania. Weighing about as much as the Cerberus, the Orion is comfortable for all day wearing, although I do find the Cerberus slightly more comfortable when resting on the head. Offering more mobility, the Orion comes with 2.5 meters of braided cable, giving gamers plenty of space to move around without pulling or snagging. In-line volume control enables on the fly sound adjustment – don’t worry about the sudden burst of noise, you can turn it down. After using the Cerberus, the automatic range was a nice relief. Instead of using a splitter, the Orion comes with a place on the cable to tuck away the mic jack if you’re just engaging with the audio ability of the headset – clever design. The Orion has a retractable bidirectional mic. I found it easy to fiddle with the mic – it emerges easily from the left ear cup and is similarly easy to retract. The wire is sturdy enough to ensure that the mic doesn’t change position when in use, letting users set the perfect distance to ensure optimal sound without breathing or rubbing noises. Now to the real reason you get a headset, the sound quality. The specs indicate a frequency response of 20 Hz – 20 kHz, but in my own tests it seemed to be closer to 20 Hz – 15kHz. When testing the dynamic range, the Orion managed 48 dBFS (decibels below full scale) with fully matched drivers providing an authentic stereo experience. The sound quality on the Orion is very good, giving a distortion-free experience even when pumping up the volume to an eardrum splitting level. That said, the bass certainly could offer more – it simply didn’t give that chest rumble that I love when blasting my music directly into my body. 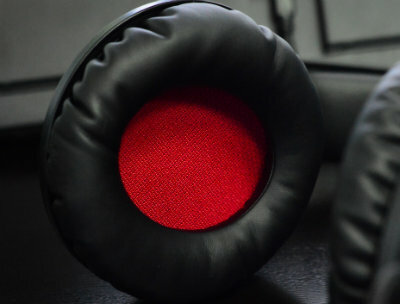 The ear cups work well to minimize outside sounds when engaging with your audio experience. Like the Cerberus, while the Orion offers a fantastic stereo experience, it isn’t surround sound. If surround sound is a must for you, then you may need to grab the PRO version with ASUS’ add on Dolby surround 7.1 virtual surround sound in order to turn your Orion into your ideal headset. The Orion offers great sound quality at a reasonable price. It is comfortable enough for prolonged gaming sessions and offers the versatility of a retractable mic, all in an attractive package. Offering slightly better sound quality over the vaguely more comfortable Cerberus, it is worth the slightly higher price. If you are making your first step into the world of headsets, the Orion sets a stellar standard.